The UK labour market continues to confound. It seemed as though the seven year spurt in employment that began in late 2012 had come to an end in 2018. The number of people in work barely increased in the summer of last year and even fell in the three months to August. However, unlike many other economic indicators, the third quarter of 2018 is looking like it could be a good one for the jobs market. In the three months to November employment increased by 140,000 and the employment rate rose to a record high of 75.8 per cent. Last week we showed who had benefitted from record employment. Compared to a decade ago employment rates for people with health problems, relatively low levels of education and those on low-incomes have been transformed. Our analysis took us to the summer of 2018 so now is a good time to ask, who has benefitted in the months since? What really stands out in today’s figures is the fact that employment appears to have been boosted by a sharp reduction in inactivity. Employment rose to a record rate, but inactivity also fell to a joint-record low of 21 per cent, with 100,000 fewer people reporting inactivity compared to three months ago. Encouragingly there was a marked decline in the number of people reporting that they are unable to work because of a long-term health problem. The chart below shows that this group shrank by 43,000 last quarter. This suggests that a tight labour market is working to entice people into work that face particular barriers to doing so. Much more of this will be needed if the UK is to rival Scandinavian and northern European countries like Sweden and Switzerland in terms of employment rates. The chart below also shows that employment this month was boosted, in the short-term, by high numbers of students leaving inactivity. Given this it is unsurprising that the main beneficiaries of the rise in employment were younger people. In the last quarter 90 per cent of the increase in employment was accounted for by people aged 18 to 34. Obviously a large number of these were students (particularly for the younger age group) but there is a sense that workers in their 20s and 30s that have traditionally found it difficult to find work are entering employment. On top of this there is also clear evidence of an improvement in job quality this quarter. There has been a particularly sharp fall (down 62,000) in the number of people that are working part-time because they can’t find a full-time job. Full-time employment has accounted for 90 per cent of the employment gains. Self-employment has also risen strongly again, the largest increase in 2016. It used to be the case that good jobs figures often went hand in hand with disappointing pay numbers. Things have started to change though. 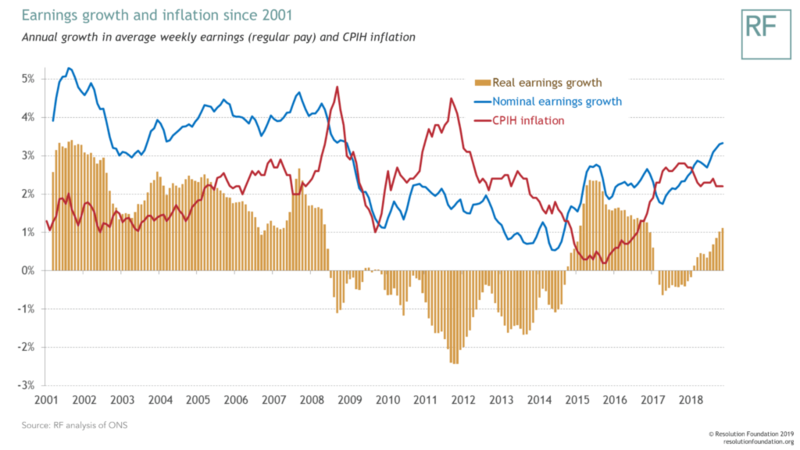 Real pay growth inched up to 1.1 per cent, still below the pre-referendum rate, and well-below that which prevailed pre-crisis, but promising nevertheless. Furthermore with inflation falling in December and expected to have dropped below 2 per cent this month it may not be long until real pay is rising at 1.5 per cent. Not exactly rip-roaring – but not to be sniffed at given the pay squeeze and stagnation we’ve experienced in the last couple of years. 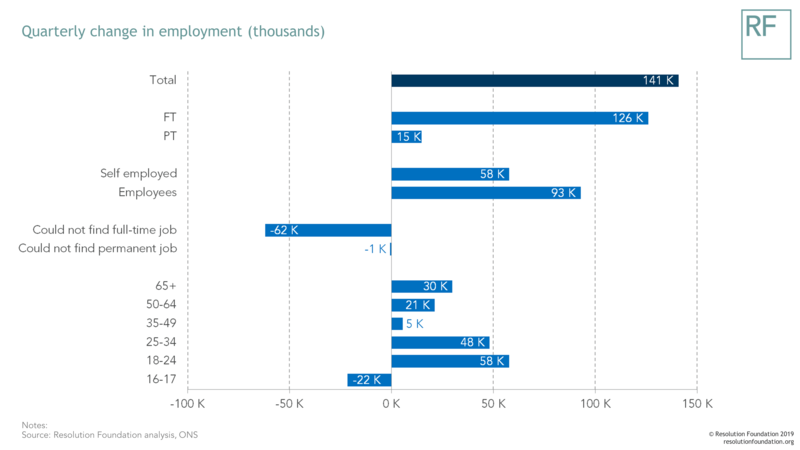 Of course all of this adds to the impression that the labour market continues to be relatively immune from the Brexit-related uncertainty that is affecting other parts of the economy. But that’s a big if – and one that we’ll be continuing to monitor as new data emerges over the coming months.